Abel O’Brennan is a winemaker with a mission. As the driving force behind the Comox Valley’s newest winery, tablets Coastal Black, life his work is all about broadening the horizons of wine-drinkers (whether they are casual sippers or connoisseurs) by welcoming them to the world of fruit wines. The term ‘fruit wine’ refers to all wines made with fruit that is not grapes. It can be made with tree fruits, berries, pomegranates and more—even, in Hawaii, naturally—pineapples. Fruit wine has been around as long as classic grape wine, but hasn’t (yet) come on board as a full-fledged member of the mainstream North American wine industry. “I missed the memo that says grapes are not longer a fruit,” says O’Brennan with a good-natured laugh. There are no grapes in any of Coastal Black’s products, but there are plenty of blueberries, blackberries and raspberries, all grown on the 820-acre Coastal Black farm in Black Creek. Their newest product is a sparkling blackberry wine. It joins a blackberry table wine, raspberry table wine, and blueberry table wine, and a blackberry as well as a raspberry dessert wine. As well, Coastal Black makes three types of mead (spiced, blueberry, and plain) from honey produced on the farm. “Fruit wines don’t get enough respect here in North America,” he says. “People think it’s something Grandpa makes in his basement. They don’t know that these fruits make really excellent wines. And there’s a misconception that it’s all really sweet, but in fact our blackberry table wine is fairly dry and pairs well with many foods. It’s our flagship product and is hugely popular. O’Brennan was interested in filling that market gap, and all the signs seemed to support him. The farm was already moving into berry production for processing, so using some of the crop for wine made sense. O’Brennan wanted to work with what grows well on his soil and in his climate. Clearly, blackberries grow extremely well: currently, Coastal Black has the largest cultivated blackberry crop in Canada. O’Brennan, dressed in worn jeans, a T-shirt and a baseball cap, perfectly fits the role of the unpretentious, down-to-earth farmer. Standing somewhere above six-foot tall, with a good strong frame and capable looking hands, he looks like someone who can fix a tractor, frame a barn, or tell you all about the soil just by squeezing a handful. He is also, clearly, a capable businessman. A closer look at his baseball cap shows it sports the Coastal Black logo, a subtle reminder that this is no hobby winery but rather an ambitious commercial operation. Since opening for business last August, Coastal Black has produced 80,000 litres (that’s 108,000 bottles) of wine and mead. The winery boasts state-of-the-art equipment which, says O’Brennan, was only possible because of the relatively large scale of the whole operation. “We definitely jumped into this business with both feet. I remember when I was starting out, I was chatting with a wine-making veteran, and he said, ‘Y’know how to make money in the wine industry? Start with a big one.’ We’ve definitely found that to be true. We have a lot of investment. Sure, it is a romantic and fun way to make a living, but the reality is that it is a capital heavy business. We are working with a business plan that has to come to fruition on schedule,” he says, sounding serious, but not worried. Coastal Black already has loyal customers—“People are buying the blackberry sparkling wine by the caseload,” says O’Brennan. Their whole product line is available at close to 60 stores across the Island. And, well before its first birthday, this fledgling winery has already brought in some prestigious awards. This past April, Coastal Black entered four wines in the Finger Lakes International Wine Competition in Rochester, New York, and all of them won awards: the Blackberry Dessert Wine won gold, the Blackberry Table Wine and the Spiced Mead won Silver, and the Raspberry Dessert Wine won Bronze. “It was a nice bit of validation. There were 3,300 wines entered from 18 countries, and 64 wine experts were flown in from all over the world to judge. Ours was one of only two BC wines to get a gold. What a feather in our cap!” says O’Brennan. It’s a pretty impressive start, and there’s more growth to come. The day after I interview him, O’Brennan is heading off to Italy for an educational tour with a company he’s buying a fancy bottling plant from. “It’ll be the first of its kind on the Island,” he says, enthusiastically. The winery is currently in the final stages of getting a patio licence, which will mean they can serve wine by the glass to visitors. He has plenty of plans for the future—a traditional wood-fired oven by the patio, a venue that can be rented for events such as weddings, a new barrel cellar, and more. Obviously, O’Brennan is as much businessman as farmer. He is also very much a family man. At 26 years old, he’s expecting his third child and is a very-involved member of the four-generation extended family that lives and works on the Coastal Black farm. For O’Brennan, who was born and raised on Vancouver Island, the story began when he joined the Ludwig clan by marrying Amanda Ludwig six years ago. With that ceremony, he stepped into a story that goes back to 1989, when Terry and Bonnie Ludwig bought a 250-acre homestead with a house and a lot of brushland in Black Creek. They cleared the land to create pasture, built barns, and brought in a herd of dairy cows. The farm thrived and at one point they were milking 260 cows a day. Over the years the Ludwigs expanded, adding land till they had 820 acres. They also had three kids, Amanda, Daniel and Phil. In the early 2000s, after going full tilt for over a decade, the Ludwigs began to contemplate making a change. Their kids were moving into adulthood, and the whole family, including its new member O’Brennan, had a series of conversations about what could happen. No one wanted to take over dairy farming (O’Brennan is allergic to cows and breaks out in hives when he gets too near them), but there were other promising ideas for the using the land. Daniel, the youngest son, was a beekeeper who wanted to move seriously into commercial honey production. Phil, the oldest son, was ready to go forward with his dream of founding a specialty sawmill that would provide custom-cut lumber. And the O’Brennans were interested in fruit farming and wine-making. The first fruit was planted six years ago, while the dairy farm was being phased out. “The year I was 22 was a huge year for me. Our first child was born, and that was the year we went big into fruit. We brought a team of Mexican workers here as labor and I had to learn Spanish,” O’Brennan says. He was also learning how to make wine, under the guidance of a consultant whose help, he says, was invaluable. “It was a learning curve, I tell ya!” he says, laughing and shaking his head as thinks back on the intensity of that year. The sawmill and beekeeping operation partner perfectly with the winery. The bees pollinate the berries, the honey supplies the main ingredient for the mead, and the sawmill provided the lumber to transform the cow barns into the winery and tasting room. The whole family lives on the property: the original dairy farmers Terry and Bonnie, Terry’s parents, their three grown-up kids, with spouses, and a couple of grandchildren (and more on the way). This set-up seems like an unusual throwback to an old-fashioned world of farming that, if we believe media reports on the dwindling of rural culture, is dying out. Although statistics have been telling us that young people are leaving the farming life behind to move to cities, O’Brennan offers an alternate point of view. O’Brennan loves his farming lifestyle. “What could be more romantic than running a winery? Sure, it can be really, really busy—for instance harvest is an eight-week marathon when we work 18-hour days to bring everything in—but on the other hand things slow down in the winter and we can take a nice family holiday. “I work long hours lots of the time but I don’t see what I do as work. Everything I do I’m doing because it’s meaningful to me. When I bend over to pick up a stone, I’m improving the ground. I love what I do. It’s a kind of freedom,” he says. He also appreciates the way the business allows him to manifest his values around community and environmental sustainability. “We like to do things naturally here. We can’t use anything that might be harmful to the bees. We don’t spray our fruit from blossom to harvest. We control aphids by releasing ladybugs; in fact, there’s a short video on the website about this, which is kind of fun,” he says. Another big value for Coastal Black is relationship. Hosting tours and tastings isn’t just good for sales, it’s a way of creating a sense of community with clients, educating them, and giving them a connection to the land and people that produce the wine they drink. “These days, people really appreciate knowing the producers of what they consume,” he says. Coastal Black runs a wine club that anyone can join. Members get special opportunity to buy exclusive releases, enhanced flexibility in booking tours, and a 5% discount on all purchases. As well, Coastal Black donates an additional 5% of all wine club member purchases to one of three charities (chosen by the member): the Canadian Cancer Society, the Vancouver Children’s Hospital and KIVA, a global organization that provides micro-loans in developing countries. There’s no doubt that all aspects of O’Brennan’s work lie very close to his heart. He’s doing something he loves, with people he loves, in a place he loves. And at the end of a busy day, when he sits down finally to sip a glass of wine and look out at the incredible view of the mountains, he surely can feel he’s fulfilling his mission. Coastal Black Estate Winery is located on Endall Road in Black Creek. online only a large greenhouse can be seen in the background, a house and a few outbuildings. However, behind that modest exterior image lies a thriving farming operation run by Bryne and Barbara Odegard. For most of the year the farm is also home to many travellers from around the world. “We’ve really gotten to realize what an amazing experience the kids are having here and how it is impacting their lives,” says Barbara Odegard, far right, with from left, husband Bryne and WWOOFers Anna Pape, Alice Cazzola and Hirofumi Ozawa. The Odegard’s moved to Fanny Bay in 1996 from Parksville where they had operated a one-acre market garden and nursery. Bryne had been a troller fisherman on the West Coast for more than 20 years and a combination of factors lead to the decision to make the switch to farming. When they found the 11.5 acres that had been fallow for 10 years but still had good soil and water potential, they knew they had found the key to launching their dream of becoming full time organic farmers. Established in 1948 by Mildred Halgren, the farm had mostly produced hay and housed goats. The Odegards loved the farm and the unpolluted Fanny Bay area right from the moment they saw it. They chose to name it Ironwood Farm because they felt it signified strength. Ironwood is also one of the names for a native hardwood bush that is best seen in June when it produces sprays of white flowers. The mice had to be evicted from the house and the floors needed more support, but eventually they had a comfortable home and were able to focus on developing their crops. “It takes time to get to know your piece of land and weather patterns,” says Barbara. “When you first start out you want to do everything and you realize very quickly that there are many factors that don’t make things work. “Number one you take stuff to the market and you realize people don’t want that. One thing we have learned is that consumers are very stuck in their ways and it is a challenge to get people to eat a vegetable that looks even a little bit different from what they are used to. And then we learned very quickly too that you have people say, “Oh you have to grow lemon cucumbers, everybody will buy them!” How many times did we try doing stuff like that? “We’ve learned over the years what does well here,” says Barbara Odegard, at work in their Fanny Bay gardens. Passion is something Barbara and Bryne have in great abundance when they talk about farming and living sustainably. Given our cool spring I thought asking about how they deal with the weather might dampen their enthusiasm. Not so, as Bryne responds: “We grow so many things that something is always happy. Luckily this year we planted a lot of stuff that likes the cool weather. 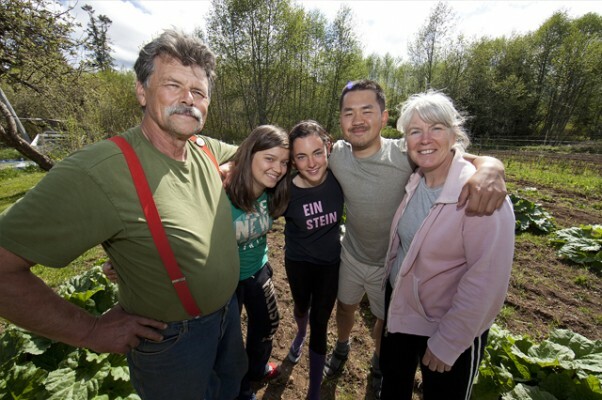 One topic that definitely brings out their passion is when they describe the difference that working with “WWOOFers”—World Wide Workers on Organic Farms—has made to Ironwood Farm and their lives. WWOOF was originally founded in Britain in 1971 as Weekend Workers on Organic Farms. The organization has spread out across the globe and is now referred to as World Wide Workers on Organic Farms. 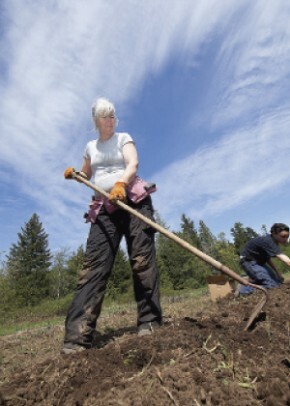 The Canadian branch of WWOOF was formed in 1985. In return for volunteer help, WWOOF hosts offer food, accommodation and opportunities to learn about organic lifestyles. The first year they hosted a young couple from Ontario. It was quite a task to figure out how to utilize their help. Fifteen years later, Ironwood Farm is an extremely popular destination for people from all over the world. They host three to five people at a time, and ask workers to make a minimum three-week commitment, and if possible to arrive on a Sunday and leave on a Saturday. Barbara handles the scheduling and both of them work directly with the WWOOFers because the vast majority of them have never worked on a farm or done any gardening at all. Arranging a good mix of applicants is what Barbara strives for because she believes one of the biggest joys of having WWOOFers at their farm is helping them to learn about each other. The day I visited there were WWOOFers from Japan, Germany, Italy and Belgium. Many WWOOFers stay in touch and some have returned to visit to underscore in person how pivotal their experience at Ironwood Farm has been for them. Ozawa is from near Tokyo, Japan. He tells me he decided to try WWOOFing because as a chef he wanted to learn more about growing herbs and vegetables. Before coming to Ironwood he made a bicycle journey from Alaska to San Diego. So he is fit, but at Ironwood Farm, he says he has become more fit and he has learned a lot about good food and working. Farming is a difficult life. Few farmers in Canada can make a living without working off the farm. The Odegards have faced these challenges and they continue to try to creatively overcome them. In addition to their daily farm work, they contribute to organic growers’ organizations, sit on boards, teach courses and give lectures. After 16 years of running Ironwood Farm they still love each other and love what they’re doing. Would they, I asked, suggest that others give farming a try? FMI go to ironwoodfannybay.blogspot.com or search for them on Facebook. Purchase their produce at the weekly Comox Valley Farmers’ Market in Courtenay.